LOS ANGELES, Nov. 19, 2018 /PRNewswire/ -- Smart & Final Stores, Inc. (NYSE: SFS), the neighborhood warehouse grocery store, today launched an in-store donation program at select Southern California, Arizona and Nevada stores aimed to raise money and collect pasta-related items for the 8th annual PastaThon, a fundraising event organized by KFI AM640 for Caterina's Club. A 501(c)3 non-profit, Caterina's Club provides warm meals, affordable housing assistance and hospitality job training for youth homeless and low-income families throughout Southern California. To participate in the food fundraiser, shoppers can speak to a cashier at their local, participating Smart & Final or Smart & Final Extra! store. Beginning now until December 7, shoppers can make a $10 donation at the register and Smart & Final will in turn provide pasta, pasta sauce, forks, bowls and napkins to Caterina's Club. Each $10 donation will provide 14 meals to kids in need. Shoppers can also make monetary contributions to support PastaThon through change canisters located at store registers. 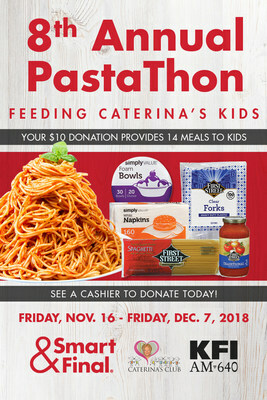 For a list of participating stores, please visit https://www.smartandfinal.com/pastathon. In addition to helping customers contribute, Smart & Final and the Smart & Final Charitable Foundation, the philanthropic arm of the company, will donate pallets of food to the PastaThon fundraising event hosted by KFI AM640, happening on December 7 at Christ Cathedral in Garden Grove, Calif.
"Smart & Final is honored to participate in PastaThon for the third consecutive year and to give back to such a worthy cause," said Barbara Van Dine, Vice President, Smart & Final Charitable Foundation. "During this season of giving, the Smart & Final Charitable Foundation is especially dedicated to giving back to our local community." Throughout the year, the Smart & Final Charitable Foundation is committed to improving the quality of life and nourishing the communities Smart & Final stores serve. The foundation aids nonprofit organizations impacting issues including hunger, disaster relief, hunger, local health and wellness, team sports and youth development and education. Most recently, Smart & Final and the Charitable Foundation raised more than $85,000 to support victims of the Butte and Woolsey Fires affecting Southern and Northern California.